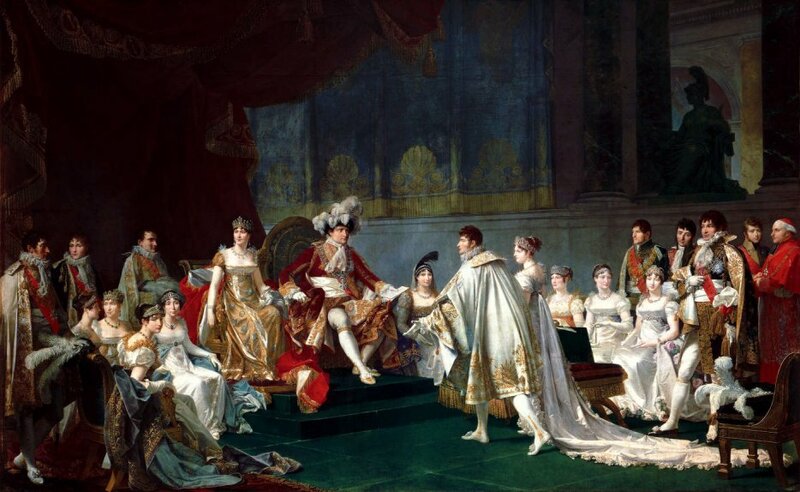 Napoleon Bonaparte had eight great-grandparents! It was by no means a truism, if one observes that his wife Marie-Louise had only four (through intermarriage)! Their historical significance was limited to the part they played in the birth of the Emperor, so this website doesn't publish their individual biographies; however it seemed to us appropriate to present them briefly, as well as Napoleon's grandparents. Nobile Sebastiano Nicola Bonaparte, born September 29, 1683 in Ajaccio , was the father of Giuseppe Maria Bonaparte, the grandfather of Carlo Bonaparte (or Buonaparte), and therefore the back-grandfather of Napoleon the First. He married on December 17, 1708, in his hometown, Maria-Anna Tusoli, who gave him six children. He was appointed Elder (Anziano) to the Council of Ajaccio on April 20, 1720, and died before November 1720 (some sources indicate October 20, 1720; others cite November 24, 1760, forty years later! ), at Ajaccio too. The Bonapartes were a branch of the family Cadolingi di Borgonuovo, lords of Fucecchio in Tuscany since the tenth century. Their lineage had moved to Sarzana, Liguria, before 1264 and to Corsica in the late fifteenth century, as we shall see below. Sebastiano Nicola was the son of Giuseppe Maria Bonaparte (February 24, 1663 - October 24, 1703), who had served as Elder at the Council of Ajaccio, and Maria Colonna Bozzi (circa 1665 or 1668 - October 16, 1704), married on November (or December) 20, 1682. Maria's dowry was 4,901 pounds and included some parts of the Bozzi house (future Bonaparte house), located on Malerba Street. His paternal grandparents were Carlo Maria Bonaparte (November 1st, 1637 - August 26, 1692), also Elder at the Council of Ajaccio on several occasions from 1666 to his death, who had married on June 10, 1657 Miss Virginia Odone (February 27, 1642 - ? ), the daughter of Pietro Odone, a merchant, and Constanza Pozzo di Borgo, a noble young woman. His maternal grandparents were Antonio Colonna di Bozzi, Signori dell Altu Taravu, and his wife Giustina Lomellini. Their relationship with the Colonna family, from which came Pope Martin V, is uncertain. Gabriele's father was Francesco Bonaparte (dead 1540), nicknamed "il Moro" (The Moorish). That Francesco was a noble man, from Sarzana in Liguria, who had served as a mercenary crossbowman and horseman in the Army of the Saint-George Bank (Banco di S. Giorgio); he had been assigned to Corsica in 1490 and had married the following year Miss Caterinada Castelletto, the daughter of Guido da Castelletto, the local representative of the Saint-George Bank. Francesco, who had retired in the 1510s, decided to settle permanently on the "Island of Beauty" (Corsica), thus founding the Corsican lineage of the Bonapartes. Born 1690 at Bocognano (Bucugnà in Corsican language), a mountain village located between Ajaccio and Corte, she was the daughter of Nobile Carlo Tusoli and Isabella N., both natives of the village. She married Sebastiano Nicola Bonaparte at Ajaccio on December 17, 1708. Carlo Sebastiano Bonaparte, born on October 19, 1720; dead in 1760. Maria-Anna Bonaparte deceased at Ajaccio on September 17, 1760. He married in 1707 Maria-Angela Salineri. They gave birth, among other children, to Maria Saveria Paravicini, paternal grandmother of Napoleon Bonaparte. The daughter of nobile Angelo Agostino Salineri (1653-1724) and of Franchetta Merezano, she married in 1707 Giuseppe Maria Paravicini. She died towards year 1741. Born in Ajaccio in 1697, he married Angela Maria Peri. They gave birth in 1723 to Giovanni Geronimo Ramolino, Napoleon's maternal grandfather. Born from N. Peri and Maddalena d'Istria, she married Giovanni Agostino Ramolino. The son of Giovan Antonio Pietrasanta (1671-1704) and of Paola Brigida Sorba, he came into the world towards year 1700. He married Maria-Giuseppe Malerba, and the couple gave birth towards 1725 to Angela Maria Pietrasanta, maternal grandmother of Napoleon. He became in 1769 councillor at the High Council of Corsica in Bastia. She married Giuseppe (-Maria) Pietrasanta. All of them were born in Ajaccio . Born on May 31, 1713, he was the son of Sebastiano Nicola Bonaparte and Maria Anna Tusoli. He married on March 5, 1741 at Ajaccio Maria-Saveria Paravicini, who gave him two daughters (Maria Geltruda and Marianna) and two boys: Carlo Maria, Napoleon's father, and Sebastiano. In 1749, Giuseppe Maria represented the city of Ajaccio to the Corsican Council in Corte. After his widowed, he remarried in 1760 Miss Maria Virginia Alata (born February 5, 1725). He passed away on December 13, 1763. Born on September 7, 1717 (or 1715), she was the daughter of Giuseppe Maria Paravicini and Maria Angela Salineri. On March 5, 1741 she married at Ajaccio Giuseppe Maria Bonaparte. She gave birth on March 27, 1746 to Carlo Maria, the future genitor of Napoleon. She died in 1750 (or 1748, even 1780 according to various sources). The son of Giovanni Agostino Ramolino and Angela Maria Peri, he came into our world on April 13, 1723. He served as an infantry and cavalry captain in Corsican regiments of the Republic of Genoa Army. He married Angela Maria Pietrasanta on October 29, 1743 at Ajaccio. Angela Maria gave him a daughter, named Maria Letizia, who would become the mother of the future Emperor. She was born towards 1725, the daughter of Giuseppe Maria Pietrasanta and his wife Maria Giuseppe Malerba. She took as husband Giovanni Geronimo Ramolino on October 29, 1743 in Ajaccio. She gave birth on August 24, 1750 to Maria Letizia Ramolino, mother of Napoleon. After her widowed, she married in second wedding a swiss citizen, François Fesch (Basel, August 2nd, 1711 - circa 1775), who served as a captain in the Genoan Navy. From this union was born on January 3rd, 1763 Joseph Fesch, Napoleon's uncle, future cardinal, then a daughter called Paola Brigida, a couple of years later. Angela Maria died in 1790, having therefore well known the future Emperor. This website has been designed for a screen resolution of 1280 x 800 pixels. Last update: 2019-03-03 21:31:28.